Sometimes when you find an obscure band that you really like from some far away locale, and you have a strong desire to them play live, you just have to accept the fact that they'll never, ever come to your hometown. In these instances, it's often necessary to physically put yourself in *their* backyard, rather than simply hope for the (near) impossible. 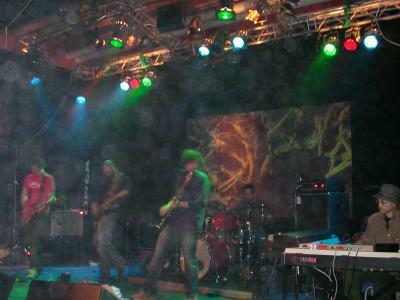 Such was the case with the Spacious Mind, the great psychedelic combo based in the northern half of Sweden, between the towns of Skelleftee and Umee. Along with a number of side projects (including Holy River Family Band, Moon Trotskij, and Cauldron), these guys have been making lots of great music for more than 10 years. I first became introduced to their music in c. 1996 via a Swedish member of the Hawkwind/BOC mailing list who once offered to put together a group order of Spacious Mind CDs to the Umee-based label Garageland (they also run a vinyl/CD shop in the town center, I discovered during my visit). That was about the only way to acquire such obscure music, at least from central Ohio where I lived at the time. In recent years, the band has continued to release new music, including the brilliant 'Live: Volume One' CD that I dubbed the year's best in 2003. And just out now is the Rotvalta CD (a live-in-studio (?) 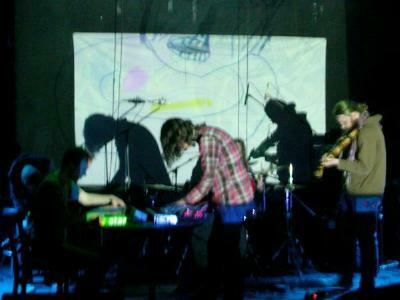 recording of instrumental psychedelic jams) that I was happy to snap up after the show. However, studio recordings and touring outside of the region has become rare over the past few years. So, the main impetus for my northward journey was to see the Spacious Mind for the first time in person, but also to have my first look at Scandinavia (apart from the city of Copenhagen). My flight from Mainz, Germany took me to a tiny airport near the town of Nykvping (sounds something like 'new shopping') that is called 'Stockholm Skavsta' only to make passengers think they're actually going to be in Stockholm within minutes of landing. Of course, it takes about 90 minutes to reach the city center of Stockholm by bus. But it's worth it... Stockholm is an incredibly beautiful city, and I was glad to have two opportunities to visit it (the first time it was cold and rainy, so especially for that reason). I also decided not to simply ride north on the train to Umee and then backtrack south over the same turf, so instead I took the ferry across to Turku, Finland, and traveled north along the east side of the Gulf of Bothnia to Vaasa, where I ferried back to Sweden, alighting just outside Umee. Along the way, I managed to make a stop in the town of Pori, home to Jussi Lehtisalo, the main man behind my beloved Circle (and spinoffs such as Pharaoh Overlord and Ektroverde). I found the landscape of Finland and Sweden quite familiar from travels in places like Minnesota, Maine, and Ontario (Canada). No wonder then that the Minneapolis phonebook is full of names like Carlson. I also found the Nordic folk to be exceedingly open and friendly, and don't hesitate one bit to open their homes to a weary traveler, even one that they had only met moments earlier. Not too many outsiders travel to these towns far from the tourist-heavy cities Stockholm and Helsinki. In fact, some people were amazed that anyone would choose to come to their town as a tourist. It's these places, though, that are often the most interesting places to visit for the very reason that they aren't 'sanitized' for tourist consumption. To segue back into music, the Moonshake organizers are also stricken with an adventurous mindset, trying to bring truly alternative music into their town of 100,000. Any fans of the krautrock band Can will note that the fest's name was derived from their track "Moonshake" on the 'Future Days' album. Over the past several years, they had held a total of six Moonshake events at random intervals, with varying degrees of success (in terms of drawing attendees). Some of the organizing committee are affiliated with the large university in the town, and therefore Moonshake maintains a loose association with the music and humanities departments. They've also tried to offer these events in a number of different venues, so this was the first time Moonshake had been presented at the HamnMagasinet, the old 'Harbor Storehouse' on the banks of the Ume River that became available space after all the port activity moved further downriver toward the sea. Along with the larger room set aside for concerts, the venue now also houses a large cafi, which provided a nice environment for relaxing and recuperating during the set changes. Because they lacked a liquor license, there were effectively no alcohol sales for the evening. Of course, this was hardly the kind of concert where the attendees were looking to booze up, but it would have been nice to have beer and wine sales at least. Buying a couple drinks at the bar is always a good way to help out the club financially, such that they'll be encouraged to continue to host these sorts of events in the future. The event started with a 15-minute "Fire Poi" demonstration by a group calling themselves "Spiritus Ignium." You can see people doing this routine (usually without fire) at any outdoor summer festival, at varying levels of mastery. Watching an amateur is hardly interesting enough to warrant much attention, but these folks were quite skilled and could do some moves that were very intricate and challenging. And if you concentrate on just the flaming balls and ignore the central figure (not hard to do, in a fully darkened room), the visual effect is quite mesmerizing. An interesting start, though it effectively delayed the start of the music program another quarter hour, leading eventually to a fairly late evening once all was finished. 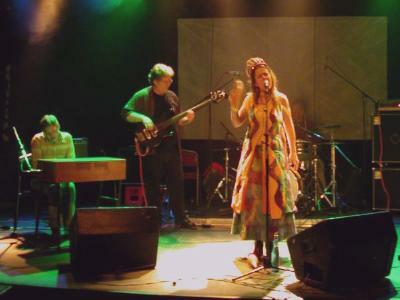 Kungahuset was the first band on stage, a five-piece locally-based group with many eccentric flavors and styles. The band's name literally means "King's House," but a more accurate translation (by meaning) would be "Royal Family." Accordingly, singer Tove Sandell wore, in addition to her colorful homemade gown, a faux tiara of some odd manufacture. Some of the early songs in the set were very upbeat, playful numbers, some sort of psychedelic circus/carnival music with Lars Samuelsson's organ chords coming mainly on the off-beats. Other tunes had a more punklike element, Sandell's voice turning from a melodic feminine flavor to something much more gritty. While this music was quite interesting and varied, it was in the middle of the set when they launched into a free-form psychedelic jam that was really the amazing part. Guest Jim Barrett, a native Australian, joined the band onstage to play didgeridoo, and they slowly built from a sonic drone up to full freak-out stage that went on for another five minutes. They followed this up with another similar sort of Middle-Eastern-flavored tune. Guitarist Jerker Jansson at times seemed to want to play 'normal' solo lines and licks, but that never lasted very long, as he would suddenly become possessed and take off into some freakish heavily-echoed or distorted jams. His Danelectro guitar, the kind Jimmy Page used to play to get that really piercing sound, was properly suited to the task. One song late in the Kungahuset set was a complex, highly-syncopated prog-rock number, something that Adrian Belew might create for King Crimson. All in all, Kungahuset really started off the event very well with a huge variety of odd-ball music. The band members admitted to me that on this rare occasion, they felt as though they were the 'pop' band of the evening, whereas normally they're seen as the freaks. But the word 'pop' far underestimates the progressive and psychedelic nature of their music. To date, the band has done just a few CD-R singles which you can learn about at their website at http://kungahuset.popmanifest.net. 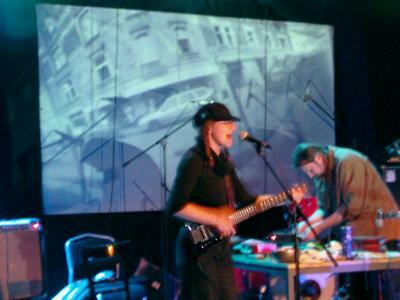 The second band slated on the bill was Avarus, the Finnish band that has gained some recognition in recent years outside their own homeland as a premiere "experimental-noise orchestra" (for lack of a better term). Their performance was advertised to include fellow Finnish soundscape artist Tomutonttu (aka Jan Anderzen, who also performs under the name Kemialliset Ystdvdt), which I thought would mean he would join with Avarus onstage. However, he did a few of his own solo pieces as an intro to Avarus' own performance. Because the stage was nearly dark and Anderzen was kneeling over his gear the entire time, it was hard to tell exactly what was responsible for the sonic textures coming forth. In any case, it was a pleasant enough mismash of electronic drones, repeating loops, noises, and other effects that went on about 15 minutes. Avarus then relieved Anderzen and did some quite similar things, but with seven people rather than just one. I had read some about Avarus online, and had heard their newest CD (Jdttildisrotta) beforehand, so I knew a little about what to expect. The seven members included a violinist, a pair of guitarists (one acoustic, one electric), two keyboardists (both with additional fx-units full of knobs), a drummer who added various vocal effects, and a woman who (at the start at least) played some sort of odd whistle into an fx-unit. Their sound collages on this night were generally lacking in much rhythm, but were instead more like a free-form 'controlled cacophony' of sound. The only animated member of the group was the drummer, who not only showed much-needed physical spurts of activity, but also added the occasional yelp or shout into the microphone. The electric guitarist stood often facing his amplifier, which I assume was for some feedback effect rather than abject shyness. The white projection screen behind the stage finally lit up during Avarus' performance with a loop of colored cartoon images making a very odd-looking movie. The screen wasn't quite big enough to depict the images in their entirety, which might have been somewhat fortunate because of the strange nature of the drawings. Sexual themes, strange beasts, and such... reminded me of an old Bevis and Butthead episode where they studied animation in class. Anyway, due to Tomuttonto's intro, Avarus only were able to play about 35 minutes, which was unfortunate because they were just starting onto something really good at the very end. I preferred the tracks on their album when they had some underlying rhythm or continuous line of sound, rather than the totally free-form stuff. And the last piece featured a nice soaring guitar line (I'd call it 'screaming gliss') over top of a slow, steady rhythm. I wish we'd heard more of this stuff, but then you can find it perhaps on the albums. In the end, I think hearing Avarus alone at home, on headphones and when in the right mood, is perhaps a better venue for them than on stage. But in any case, they added an important 'voice' to this multi-faceted event. The Magic Carpathians Project from Poland are centered around guitarist/vocalist Anna Nacher and multi-instrumentalist Marek Styczynski. Often times, they play/record with some guest musicians, but on this night they were just the core duo. I was familiar with a little of their music from their two US CD releases, one a split CD with Maine's Cerberus Shoal. Magic Carpathians' music is quite melancholy and introspective, even when Nacher's singing and guitar becomes very spirited and loud. She uses a lot of echo effects and delay on her guitar, which gives her riffs and strums a lot of extra ambience, and produces a good backdrop for her passionate voice to color in. Styczynski plays all manner of percussion instruments; gongs, blocks, bowls, cymbals, but also plays a number of wood flutes and an e-bass unit. Their set was made up of about six pieces, a couple recognizable from their newest CD "Sonic Suicide" that they were selling after the show. My favorite track, though, was a textural piece built atop a repeated drone-like guitar motif. Nacher sang lines like "Wherever you go, she's there inside you" while Styczynski countered with some nice flute melodies. The video presentation behind them was of stark black-and-white images of landscapes, people, old buildings, and such. It was quite a good fit to the music, which did present a lot of various shades of grey, musically-speaking. They had a few problems with the sound though, especially on the finale track "2003" which saw Nacher's amp start to produce a lot of static in the PA. A very moving performance irregardless of problems beyond their control. The Spacious Mind came onstage about five minutes before the show was scheduled to end (1 AM). So they played a 50 minute set just like the other three bands. Starting off with a very ambient intro featuring bowed guitar (at first, using a real bow, but then later an e-bow device), they very gradually built the piece into a psychedelic onslaught. The drummer, a guest on this night as their regular drummer David was unavailable, switched from mallets to sticks finally, and the whole band spiralled up into an amazing climax before backing down again. A second build-up phase started up with a repeated cascading guitar riff, that went on a little too long for my tastes, but eventually led to a second monstrous finish. Halfway through the set, they paused for a few seconds, reloaded, and started off again with a shimmery organ intro from Jens Unosson. The basic underlying riff for this second piece was simpler, and slower, which made for an effective "space-stomp" over the last 25 minutes. Twin guitarists Thomas and Niklas (original guitarist Henrik Oja has moved over to bass) traded roles between riffing and playing lead, the latter mostly screaming slide guitar runs and such. Eventually, they gradually came in for a landing for the final time after what was a very nice, but somewhat truncated performance. I think some of the jams on their CDs (the aforementioned Live: Volume One) were more inspired, but nevertheless it was a great experience for me to have witnessed the Spacious Mind on stage for the first time. Hopefully, it won't be the last. All in all, Moonshake #7 was a very nice event, and I'm happy I made the trip. Not only for a great evening of very forward-thinking and challenging music, but also because of making some new friends with similar tastes and proclivites as myself. I wish organizer Anders Lundqvist all the best in planning future events and thank him, Jerker & Tove, and Anna & Marek for hosting me in their homes and for interesting conversations over the weekend.